Specializing in all the new Japanese confectionery releases. Keep checking back here for product reviews on such popular brands as Pocky, Pringles, Doritos, Hi Chew, Puccho and more. 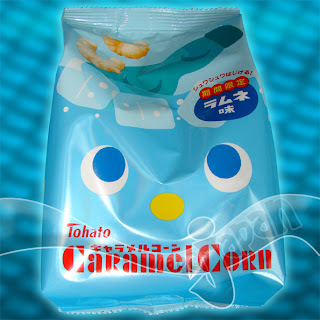 We want to hear all of your opinions on the newest Japanese candy too! 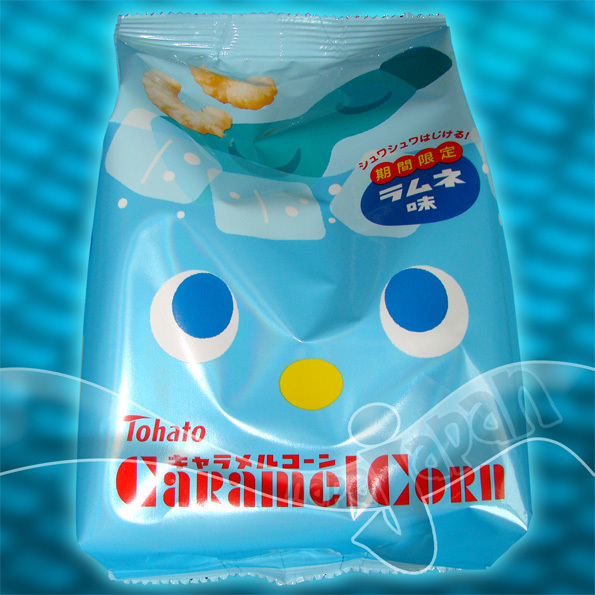 Packaging - Cute and appealing light blue foil bag with the classic Tohato eyes and nose adorning the package. The traditional Japanese Ramune (white citrus soda) bottle pokes out of a tub of ice cold water signifying summer has arrived! 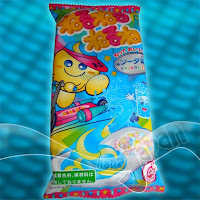 Opens from the top like any ordinary chip bag. There is no reseal on this package so you better eat them all in one sitting. At First Glance - I didn't expect these to be so white though if they were blue I probably would have been reluctant to try them. Each corn puff curl is about 1.5 inches (4 cm) if they were straightened. A sweet Froot Loops® cereal aroma escaped the bag upon opening. The quantity of product in the bag was surprising and impressive so I was looking forward to munch away during my daily snack time (until I looked at the nutritional info...we will get to that later.) Anyhow, these are very sturdy despite the light weight and there was no breakage at the bottom of the bag. What's Inside - These contain light and crispy corn with a thin layer of flavoring. The consistency from the outer coating to the center of the corn curl is very even. The Taste - Caramel is in the product name but caramel is not what you are going to experience with this flavor. All I found was a light citrus flavored coating which was VERY sweet. The corn curl is sweet to begin with so a lot of sugar was used. The package claims these to be fizzy however it was very hard for me to pick up any carbonation. All I got was a tangy and sweet flavor though the ramune flavor was quite accurate. 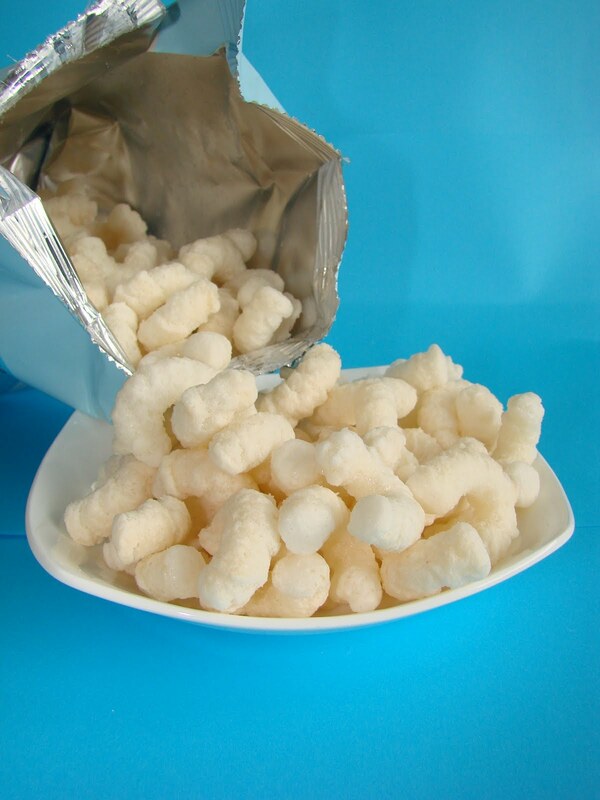 The crunch can be described as when you eat cheese puffs though the outer coating is slightly harder. No real aftertaste except for the sugar. 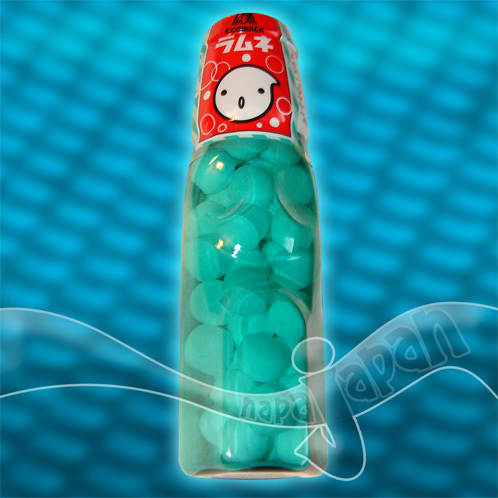 Extra Info - Ramune is a popular Japanese white soda that is usually consumed in summer. The uniquely shaped glass bottle has a glass marble under the cap to seal it. To open, the marble is pushed down into the pinched neck of the bottle creating a fizzy back-flow of soda. 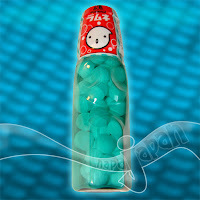 Check out the Ramune candies we carry at napaJapan. Energy - 400.4 Calories * we told you there was a lot of sugar! Ten Star rating - 6.5/10 Too sweet for me!